Filing for bankruptcy is stressful for anyone, but with Atty. Kovacs knowledge, experience and professionalism, he guided us through every step of the process. When we contacted him with questions or concerns, he always responded by email or phone promptly and always kept us informed. We highly recommend Atty. Kovacs and his staff for anyone with legal needs. From the time I started my process to the time it was finished I was always treated with respect and consideration. Bankruptcy is a hard reality to come to. You feel so overwhelmed with your situation but hate to have the stigma of filing bankruptcy follow you. With that being said, Robert made the process smooth and was very supportive. He never made us feel like deadbeats and understood that this was our only option and we shouldn't feel bad that we needed to file to help turn our lives around. Although our case was not the typical case since my spouse died in the middle of our case. Robert was ever so supportive and took care of everything that was needed. He always responded quickly and made me feel like I was his only client. I would highly recommend Attorney Robert Kovacs to anyone. It has been a pleasure thus far working with Attorney Kovacs and team. 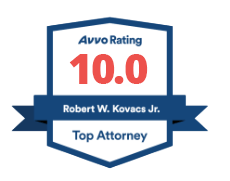 Attorney Kovacs is not only well versed in his profession, but, very personable, and always open to assist with any questions both my husband and I have had. Thank You! The professionalism, caring and concern has truly taken me by surprise compared to what I have received in the past. No one has ever taken the time to fight for me like you have. Thank you. I found Robert to be knowledgeable and caring. His manner was professional yet friendly. I would recommend him to anyone looking for financial legal assistance. Communication is key. You and your office do a great job. Robert is professional, he takes the time to explain things and does not judge, my experience was positive and I would highly recommend him. Attorney Kovacs was very professional and thorough. He explained the entire process to me clearly and was sure to give me the time to make sure I was comfortable with my decisions. He was very personable and understanding of my situation, making me feel very comfortable with any decisions made.